cokelat Dark atau White chocolate? Dark , my friend really hates white chocolate but I dont understand how u can hate it? I guess u need a more mature taste level for that? White chocolate is awesome! But if you want both buy a Hershey's cookies and Cream bar! I like dark chocolate better - I think white chocolate is too sweet! Dark chocolate. I don't like white chocolate that much. 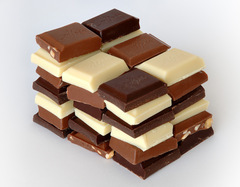 Dark chocolate and white chocolate both contain cocoa butter and are eaten as dessert or used in confectionery. Dark link is produced by adding cocoa butter to sugar and cocoa powder. Unlike milk chocolate, dark chocolate does not contain any milk solids. Taste:A more chocolate-like taste, and a bitter aftertaste. White chocolate does not really taste like chocolate since it has no cacao. Health benefits: High cocoa content has been associated with positive health benefits, especially cardiovascular health, from flavonol antioxidants. Does not offer the same health benefits as dark chocolate. So, Dark Chocolate is better than White Chocolate. Both! :D You can't expect me to choose when it comes to chocolate!